Home / Products / Posters / Don Edwards ‘Cowboy Singer’ Commemorative Poster. Don Edwards ‘Cowboy Singer’ Commemorative Poster. 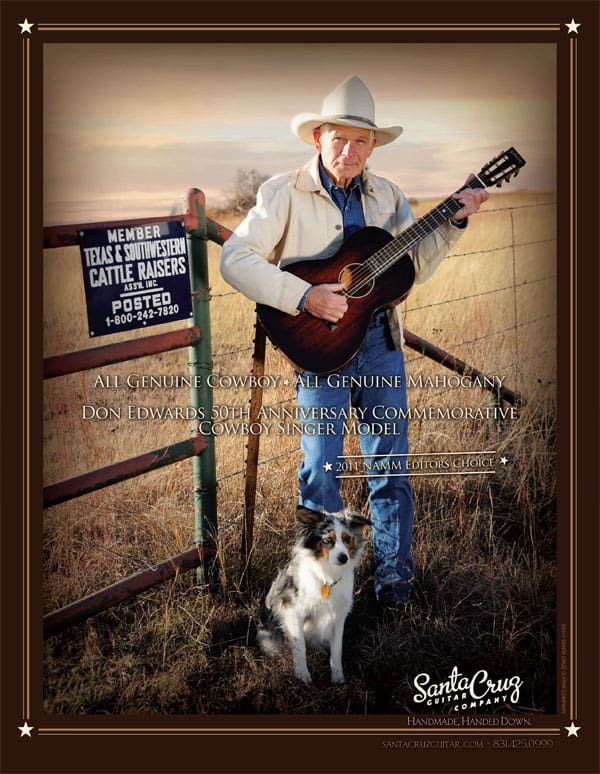 Since we debuted the Cowboy Singer, Don Edwards signature model guitar, early in 2011, requests for copies of the advertisement featuring Don and his trusty cowdog Smokey have been pouring in faster than you can say ‘Texas and Southwestern Cattle Raisers Association.’ To appease all the Don Edwards fans out there (and so we could each put one up in our homes) we are proud to offer the Cowboy Singer Poster. At 12×15”, this smaller poster is the perfect size for framing at the homestead or hanging in your local watering hole. Shipping is included in the price, and it is mailed in a tube for safety. Bring it to your next Don Edwards concert and have it signed by the man!